Well, it’s been three weeks that we’ve been focusing on making the most of our mornings. I’ve developed some good habits, been challenged to implement more self-discipline in my life, and been so encouraged by those of you who have left comments or sent emails sharing about the progress you’re making! In this final post, I want to talk about the why behind making the most of our mornings. Because if we don’t have a reason for doing what we’re doing and making big changes, it’s a lot harder to find the motivation to stick with them. 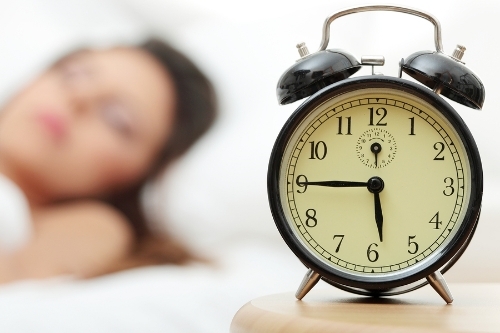 Throughout this series, I noticed that many people equated “making the most of your mornings” with getting up early. While I’m a fan of early rising, I don’t think you need to get up early in order to make the most of your mornings. Sure, many people (myself included) have found that the day is much smoother and more productive if you get an early start. But honestly, what time you get up is not the point. In fact, some of you have said that your mornings go better when you sleep in. Find out what works for your family, your body’s clock, and your season of life — and then run with that! Getting more stuff done should be a means to an end, not the be all, end all of life. On my deathbed, it’s not going to matter how many hundreds of things I crossed off my list if I ran everyone over and ran myself ragged for the sake of productivity. The reason for using our mornings well is so we have time for what matters most. If I can work toward more order in our home and more self-discipline in my personal life, it frees me up to have more time to invest in serving and loving other people, more time to savor the beauty of nature, more time to spend enjoying my family and friends, more time to stop and share a kind word with a stranger or someone in need, and more time to make a difference in someone else’s life. Making the most of our mornings doesn’t always mean we add more to our plate, become a powerhouse of productivity, or cross more things off our to-do lists. But my hope is that some of the things you’ve learned from this series and some of the habits you’re working on developing will allow you to be able to have time and energy each day to focus more on doing what matters most. 1. Think back over the last three weeks and leave a comment telling us what you learned and hope to carry with you as a result of this challenge. 2. Consider what matters most in your life and contemplate how you can cut back on the unimportant to make room for the important. I’ve found that it’s helpful to routinely step back and ask myself, “Is this going to matter in 25 year from now?” This simple question helps me gain clarity when I’m struggling with prioritization. Last night, I went to a ladies’ get-together and then had an 8 p.m. dinner meeting with some folks from a company in California that I work with. I knew that it was going to be a late night and I knew there was going to be no way I’d be able to get my evening routine done and get to bed on time. In fact, I didn’t get home until 10 p.m. and then I couldn’t fall asleep until 11:30 p.m. — thanks to the extra cup of coffee I had in the afternoon to try and help me be alert for the meeting! As a result, I got up late this morning (well, “late” is a relative term, but it was quite a bit later than I usually get up) and I started the day tired and behind. So what do you when you fall off the bandwagon? Life happens, things come up, and things are never going to go along perfectly smoothly all the time. When you hit a rough patch, have a disruption to your normal schedule, or you’re up all night with a sick child, don’t beat yourself up or feel all frustrated that you got off track. This won’t do anything to help you — and it will likely only make matters worse. You’re going to have disruptions. That’s life. Whenever possible, though, plan ahead for them. Since I knew that I wasn’t going to get home until late last night, I went ahead and planned that I would be getting up late. Knowing that this was part of the plan helped me to not feel so off-track when I got up “late”. When things are out-of-sorts or your schedule gets thrown out the window, just focus on doing the best you can do. For instance, I simplified my usual morning schedule today, made sure my to-do list wasn’t too long, and just prayed for God’s grace to help me go through today even when I was tired and feeling behind. It wasn’t the best or most productive day, but I got the main things accomplished, and I’m going to bed with the house in fairly good shape and things mostly back on track. Falling off the bandwagon can be a great reminder of why you’re making the changes you’re making. I realized last night that staying up until 11:30 p.m. felt like I was staying up until 2 a.m. My internal clock is getting re-adjusted back to a schedule that works better for our family — and that is encouraging! When you fall down or hit a bump, don’t let it throw you off course. Just dust yourself off and keep moving forward. Don’t give up! Tiny steps in the right direction are always better than standing still or moving backward. Have you ever resolved to drop a bad habit–and failed? I have. And I’m not alone. You may decide you need to drop a bad habit, but it’s hard to just QUIT doing something. You may be committed to change, and have fabulous intentions–but you still struggle to follow through. Why? It’s because people typically set themselves up to lose. To be successful, you have to replace a negative habit with a positive one. So instead of resolving to “stop eating junk” you have to “choose healthy snacks” instead. This isn’t just a question of semantics: it’s a powerful–and overlooked–difference. This is so true — especially when it comes to making the most of your mornings. If your normal course of action for the last five years has been sleeping in until the last minute each morning and then running around in a crazy chaotic mess trying to get everything done and yourself out the door on time, telling yourself that from now on you’re going to wake up early and get a bunch of extra things done in the morning is probably setting yourself up for failure. No matter how strong your resolve is, determination alone is probably not going to be enough for long-term success. Don’t get me wrong; commitment is the first step. But it’s just that — the first step. If all you ever do is commit to change, I’m proud of you for your drive and desire to change, but I want you to see long-term success in the goals you set. So you’ve got to take it a step farther and stop focusing on what you’re giving up and instead focus on the good habits you are resolving to instill in your life. Once you’ve determined what areas you need and want to change, pick the most important areas — those that are going to make the biggest difference in your overall life, sanity, and fulfillment. Start with those and come up with a specific plan for the good habits you are going to focus on implementing in your life. For instance, if you want to make getting up by 6 a.m. a reality, plan to have everything done for the day by 8 p.m. or earlier so that you can wind down, get ready for bed, and get to bed at a decent hour. In addition, figure out what things you love to wake up to in the morning and implement those as part of your morning. Maybe you love a good cup of coffee with special creamer and classical music playing in the background. Buy the special creamer, set the coffeemaker to turn on right before you wake up, and set your alarm to play classical music beginning at 6:05 a.m. By doing these things, you’re helping yourself succeed — and making it a whole lot easier to get up in the morning. Last Friday, I confessed that I’ve been struggling with making time for getting a shower and getting out of my workout clothes in the morning. For some of you, I am sure this seemed beyond bizarre that I can’t get my act together in this simple area, but you all were so gracious to give me such helpful suggestions and practical ideas. I spent the weekend mulling over things and devising a plan. I realized that one of the problems was that I was feeling like I had to always complete the full P90X workout every single day — even if we hadn’t started it until later than planned. Often, this was throwing off my whole morning since once we were finished working out, there was no time for a shower before I needed to jump into our morning chores and homeschooling. I was already laying out clothes as part of my Top 5 Evening Must-Do’s (not that I was ever changing into them, but…), however, I realized that I was mostly choosing outfits that I’ve worn so many times I wasn’t really excited about putting them on. I was inspired by some of you to consider sprucing up my wardrobe a bit to make getting dressed in the morning a little more fun. 4) As Soon As I’m Showered and Dressed, I Get to Have My Morning Coffee. I love my morning coffee. It’s my cup of happy that I look forward to waking up to. I realized that making this rule would highly motivate me to get showered and dressed! For those of you who get showered and dressed every day without nary a thought or consideration, I’m sure this list seems over-the-top crazy. And it might be. But I had to draw a line in the sand and I had to be very specific if I want to overcome this lifelong nemesis. I’m hoping sharing this might encourage or inspire some of you who are struggling in this area or another area. Don’t just say you want to change; come up with a clear cut plan of action for making the change happen. And then go do it! Bedtime: I made it to bed by 9:30 last night — finally managed to hit my bedtime! Wake Up Time: 4:35 a.m.
4. Read The Real Reason You Can’t Quit Diet Coke, Ditch the Junk Food, or Get to Bed on Time and think about one area in your life that you are currently struggling with. How can you set yourself up for success replacing a negative habit with a positive one? I’d love to hear what you come up with! A few months ago, Crystal did a series of posts on how getting up early could give you more time in your day. I took those posts to heart, and decided to give it a try. Go to bed every night by 10 p.m.
Get up every morning at 7 a.m.
Read a chapter from my Bible every day. Write a page in my journal every day. Read from a book every day. Next I posted my list on the bulletin board over my computer so that I would see it every day. After a few days, I decided that I needed some sort of reward system. Amy Lynn Andrews had recently posted a “productivity secret” from Jerry Seinfeld, so I decided to use his system. I gave myself a star for every day when I accomplished items #2-#5. I decided to give myself Sundays off, which worked well for me. Later, I also added Crystal’s technique of keeping track of the books I read on Pinterest, which has been another great motivator. As with most goals, I have had some set-backs. First, my kids started getting up when I did which was really frustrating! However, with time, they have adapted to my new routine. Now my 3-year-old daughter often wanders out and sits by me while I’m reading and writing. I usually have to finish my new routine by getting my 1-year-old son out of bed and changing his diaper. I have also really struggled with goals #1 and #6. I think I will have to focus more on them in future months, but I am still happy to be accomplishing four out of my six goals. I have been reading my Bible and writing in my journal daily for the first time since my daughter was born three years ago. I have finished 12 books in 2012 — 9 of those books were finished in the last two months! I have been able to write more regularly on my blog. I have needed fewer naps since I have been trying to get to bed earlier. I am also tired when it is time to go to bed. By moving up my schedule, our entire day begins and ends earlier. All of our meal times are now happening earlier. I have accomplished more of my other goals for the year, including outings with the kids and home improvements I had planned. When I first began getting up before my kids, I dreaded the thought of getting any less sleep or adding more tasks to my day. Now, I find myself looking forward to “my time” in the mornings as a breath of fresh air. Getting up earlier than my kids jump-starts my whole day and gives me structure. Doing something I love first thing keeps me motivated to continue my new routine! 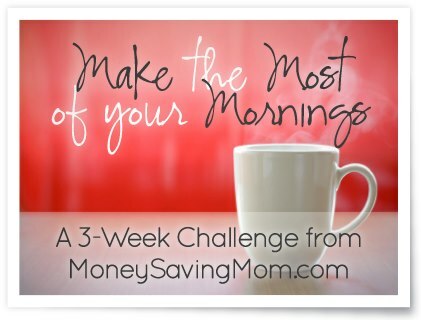 Have you accepted Crystal’s challenge to make the most of your mornings? What has or has not worked for you? Jessica is the child of a loving God, the wife of a wonderful man, and the mother of two energetic toddlers (with a third on the way!) She is a lifelong learner who loves reading, writing, bargain-hunting, creating art, and laughing until her face hurts. Jessica writes about living abundantly on one income at The Abundant Wife.